1. 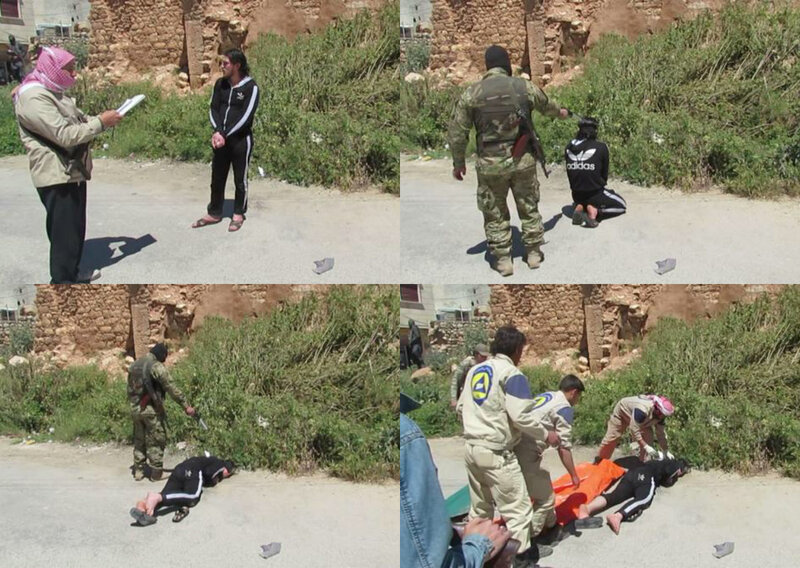 That the White Helmets is considered, by James Le Mesurier, as a group that promotes itself to be “unarmed”, apolitical and neutral, when it is obvious that they are politically biased and armed (see details below). 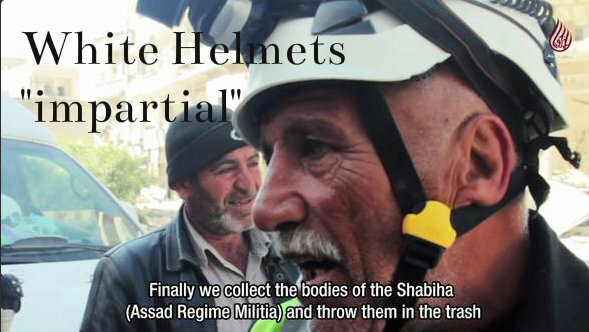 Were these SAA bodies which have been piled-up unceremoniously, one on top of the other, and trampled upon by these same White Helmets who are sold as “saints and neutral saviours”, added to others flung before them, into the disease infested waters of the River Queiq? It appears so. 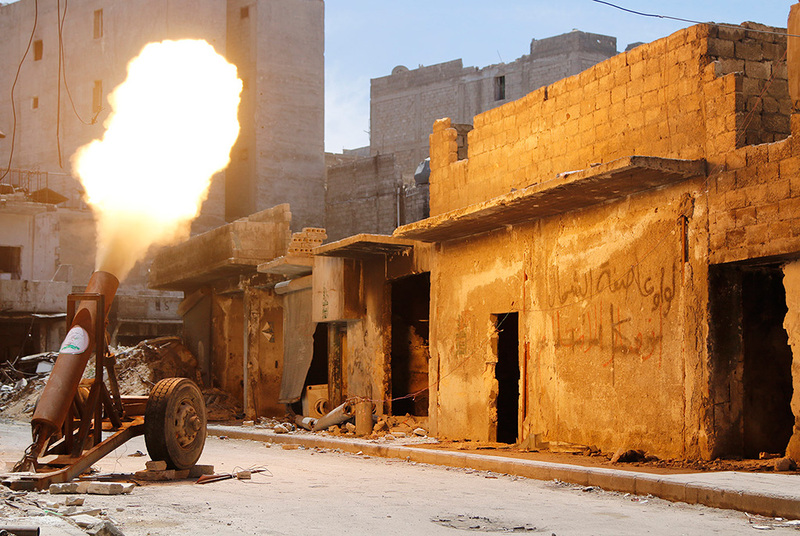 The SOHR and western media completely ignore (and cover-up) regular incidents of so-called “moderate” rebels (supported directly by the US and its CIA) who regularly target civilian areas. 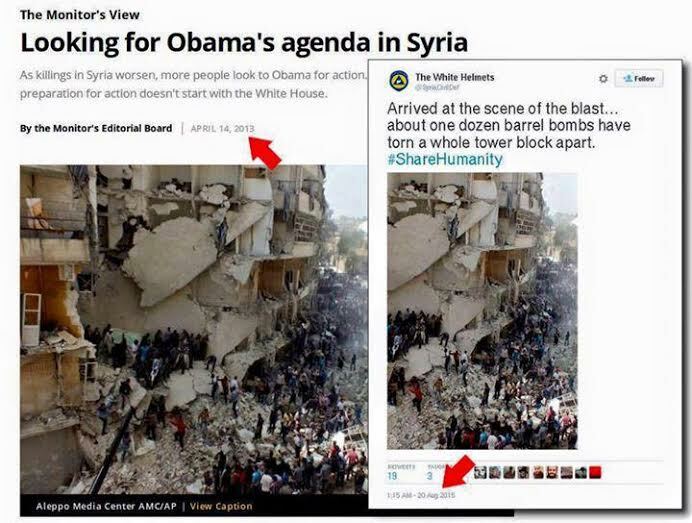 They are targeting civilians and then blaming these attacks on the Syrian government through the same ‘activist’ media channels. 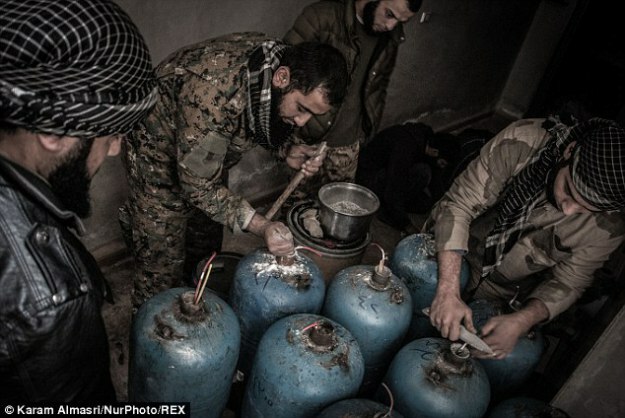 ~ Paul Larudee – Mythology, Barrel Bombs and Human Rights Watch. Here is a very clear case of the lines between unarmed humanitarian and armed terrorist mercenary being more than a little blurred. 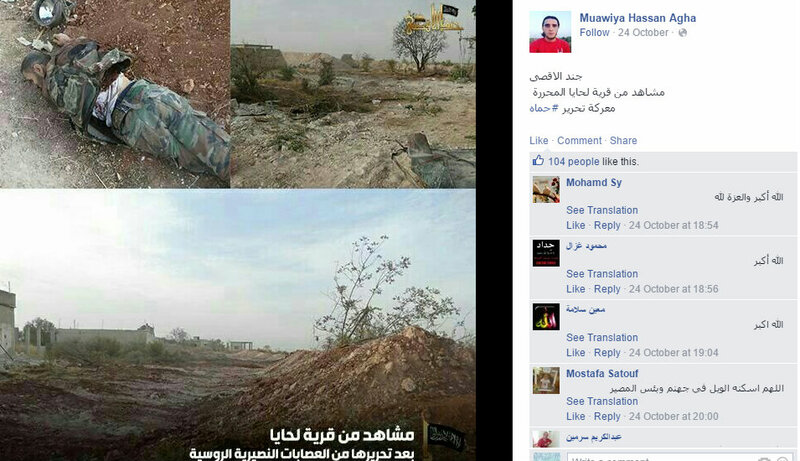 In one photo Agha is seen clearly celebrating with Al Nusra wearing his White Helmet tabard. 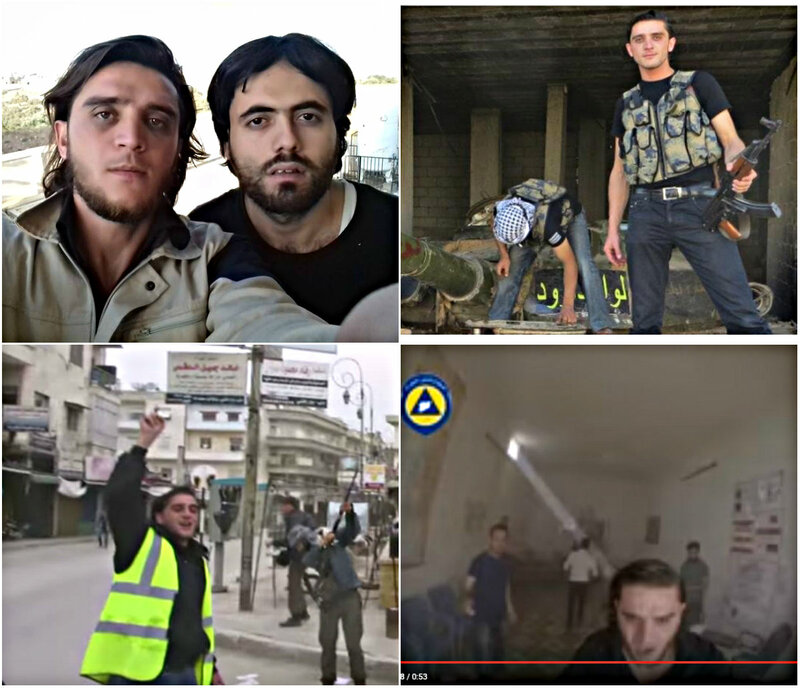 In the stills taken from the alleged Russian hospital bombing in Sarmine, Idlib, he is spotted emerging from the “bombed” building. 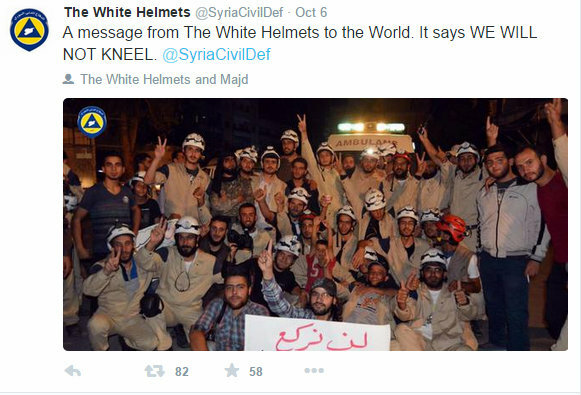 Again, contrary to White Helmets public claims of neutrality, his association with Al Nusra and his brazen show of armed affiliation reveal yet another White Helmet whose role in this conflict and is far removed from that of an impartial, unarmed ‘humanitarian’. As Syrian based, Palestinian/Lebanese Christian nun Mother Agnes Mariam de la Croix stated unequivocally in her recent interview, 90% of IDPs [internally displaced persons] in Syria have actually taken refuge in Government held areas. 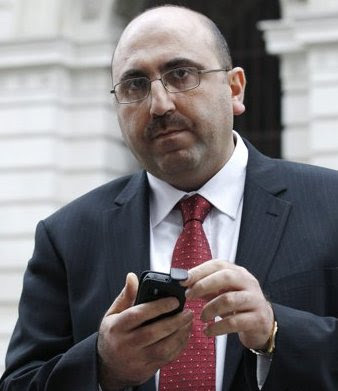 If we really want to support Syria in this battle against such a complex array of interventionist forces, we must locate that compass and allow it to point us squarely towards the truth, however hard that truth is to accept and however remote might appear from the mainstream narrative. In fact I would go as far as to say, the further away you get from the mainstream narrative, the closer you get to the truth. 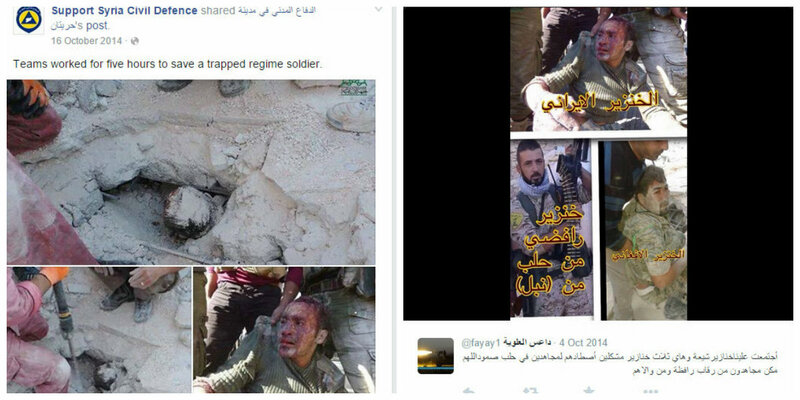 Above: on the left hand side is a post dated Oct 16, 2014 from the Syrian Civil Defense Facebook page, the White Helmet ‘rescue’ version , while the right hand side is from an earlier Oct 4, 2014 Twitter post shows Al Nusra Front’s likely ‘execution’ version of the same event.